Clawfoot tubs are made of cast iron and get their name from the four feet that raise the tub off of the floor. Traditionally, the feet were in the shape of bird claws, but now come in a wide variety of designs. 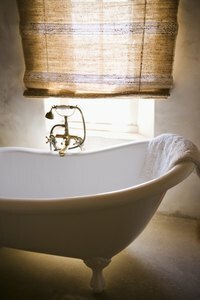 While cast iron tubs are durable, the outer enamel often becomes scratched and chipped. You can paint the exterior of the clawfoot cast iron tub to restore its appearance. Detach all plumbing from the cast iron tub if it is installed. Spread a tarp on the floor directly beside the clawfoot tub. Lift the tub up off of the floor with the assistance of four or five other people. Turn it on its side and then upside down, positioning it on top of the tarp. Lay additional tarps over all other objects in the room to protect them from paint. Examine one of the feet and locate the nut on the bottom of it. Remove the nut using a wrench and then slide the metal foot and the bolt off of the tub. Repeat the process to remove the other three feet. Put on rubber gloves and a respirator and open any windows in the room. Spray an acid-based tub cleaner on the entire exterior of the cast iron tub to remove dirt and rust areas. Allow the cleaner to sit for five minutes and scrub it with a nylon scrub brush. Fill a bucket with clean water and wipe down the tub's exterior to remove all traces of the cleaner. Let the tub dry completely before proceeding. Open a can of acid etching primer and apply it to the entire exterior of the tub using a sponge. Allow the acid to sit for 15 minutes and then rinse it off with clean water. The acid etching primer makes the paint stick better to the cast iron. Fill the tank of a paint sprayer gun with a latex primer designed for metal. Spray the entire exterior of the tub with the primer until no part of the iron is visible. Allow the primer to dry completely. Empty and clean the paint sprayer per the manufacturer's instructions. Refill it with an acrylic urethane enamel which provides the shine typical of cast iron tubs. Spray the exterior of the tub with the paint just as you did with the primer. Apply two more additional coats of enamel, allowing each to dry before adding the next. Allow the tub to dry for at lest 24 hours before reattaching the feet and turning it back over. If desired, you can move the clawfoot tub outdoors to paint it. However, due to the extreme weight of the iron, this is often not feasible. Can You Put a Claw-Foot Tub on Porcelain Tile?